There are already several reports and publications analysing the adoption of open data across the globe. 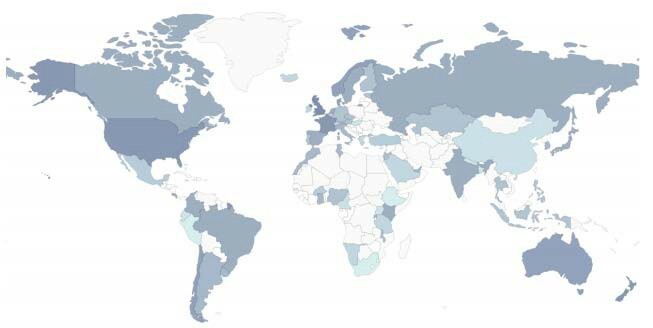 The Open Data Barometer 2013 (Davies, 2013) focuses on the analysis of open government data (OGD) in 77 countries in terms of context, availability, and emerging impacts. The report is structured in three sections: (1) readiness to develop an open data strategy; (2) the extent to which such as strategy has been implemented; and (3) an update of the state of the art is expected for the second half of 2014. The figure above illustrates the diversity of the OGD landscape in terms of adoption and readiness of open data and the level of activity of individual governments. Darker colour in the heat map means higher level of readiness of open data and more active involvement of the government. For the open data readiness, the variables are divided into three components: “Government capacity and the presence of government commitments to open data; Citizen and civil society freedoms and engagement with the open data agenda; Resources available to entrepreneurs and businesses to support economic reuse of open data” (Davies, 2013). 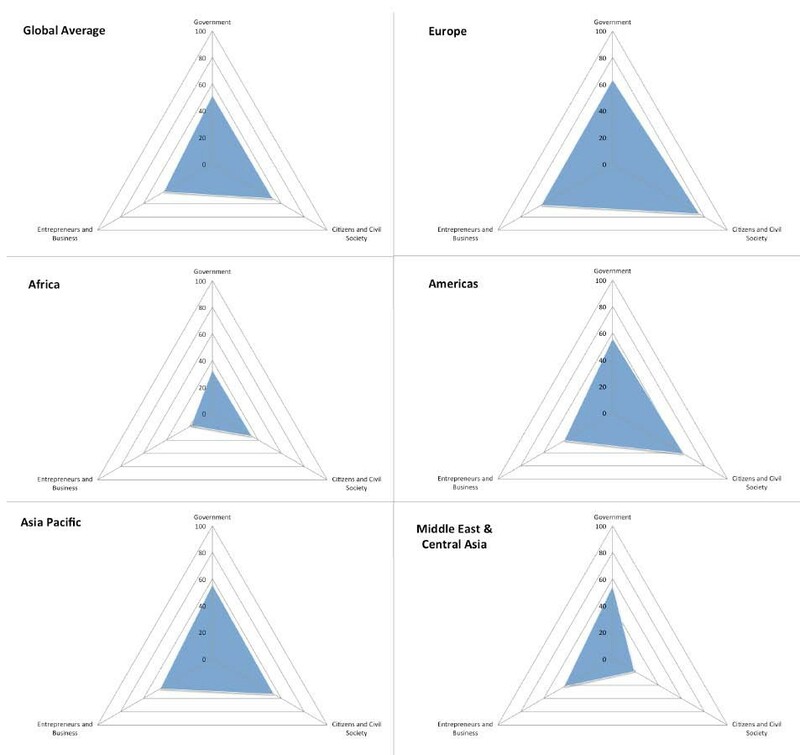 The following figure uses radar charts to illustrate the readiness of OGD in different regions. From the charts, we can see that, Europe is the leading region, while the deployment of OGD in Middle East & Central Asia and Africa is very limited. The Open Data Index was launched in 2013 by the Open Knowledge Foundation as a mechanism to assess the state of open data around the world. It covers information concerning the data sets published by national governments in over 70 countries. Annual snapshots of the data are presented on the Web site to showcase the results of the project. One of the main goals of this project is to stimulate debate and action between citizens and their governments to lead to the release of further data assets. From the 700 key data sets that have been identified in the current release of the index, only 84 data sets are considered open. The Open Data Index structures the open data sets into 10 different categories, such as transport timetables, budget, election, national map, etc., and each category uses nine same criteria to measure the availability of the data, such as whether the data is online and free of charge. 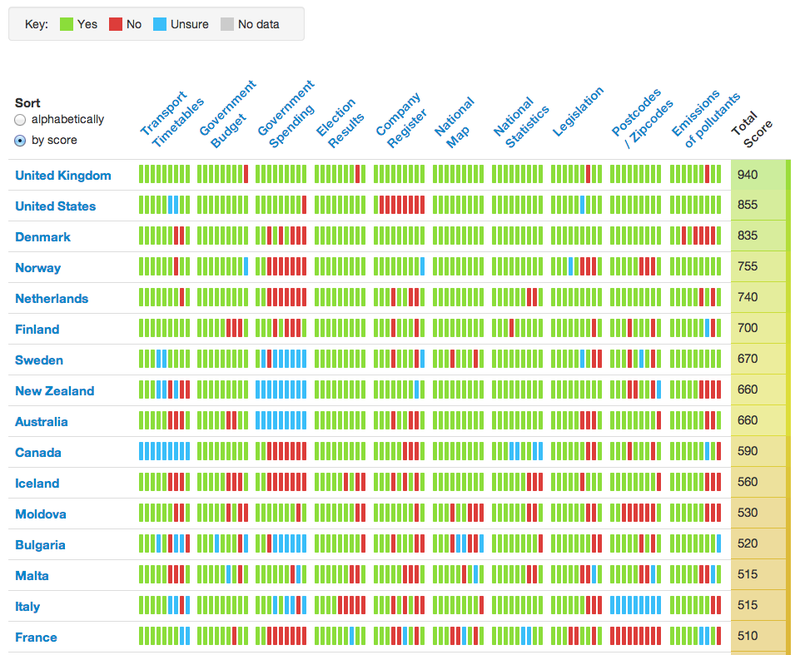 Based on the submissions provided by the editors, the index gives a total score of openness for each country. The next figure demonstrates a snapshot of the countries with top scores in Open Data Index. From the snapshot we can see that, until now May 2014, 6 EU countries are in the top 10 of the index. This project has received funding from the European Union’s Seventh Framework Programme for research, technological development and demonstration under grant agreement no 611988.